Sonic and Tails from the SEGA games and Archie Sonic comic books battle evil on the journey home in a graphic novel adventure co-starring Lupe and the Wolf Pack. Sonic and Tails have defeated the evil wizard Ixis Naugus. Now for the hard part: getting home in one piece! It's one adventure after another as Sonic faces Mutates, Robians, and Kodos's gang of thugs. All the while, a mysterious presence strikes out at Sonic from space! Also in this volume you'll find the entire Wolf Pack saga! Lupe and her pack of Freedom Fighters left home years ago to fight Dr. Robotnik, and now they too must make the long trek home. But the elements are against them, and the Wolf Pack will make a discovery that will change Lupe's family forever! 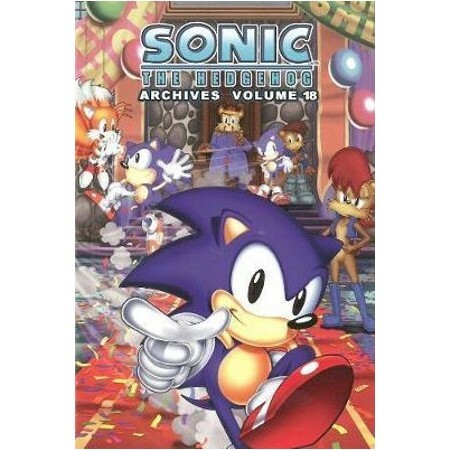 Sonic Archives Volume 18 collects Sonic the Hedgehog #67-70. THE SONIC SCRIBES are the many talented writers and artists who have helped create Archie Comics' popular and record-setting Sonic the Hedgehog comic books and graphic novels for two decades. They include early favorites such as Ken Penders, Angelo DeCesare, James Fry and Art Mawhinney, recent greats like Ian Flynn, Ben Bates, Tracy Yardley! and Jamal Peppers, and veterans like Patrick "Spaz" Spaziante and Steven Butler - and many more!